Ergonomically curved push handles with comfortable grips reduce the risk of injury for users. Custom models are also available to meet any specifications. 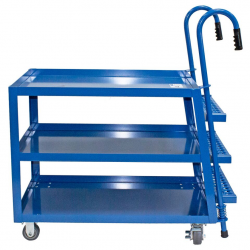 To learn more about Stock Picking Carts and other material handling equipment from BHS, call the sales team at 1.800.BHS.9500.